We’re still waiting for the second iteration of Google Glass and news about Virtual Reality headsets from the search giant or Apple are little more than rumours and speculation at the moment. But for Epson, the Japanese company best known for printers and projectors, Augmented Reality is almost old hat. Speaking at an Epson Augmented Reality showcase in London this week, Valerie Riffaud-Cangelosi, New Markets Development Manager, said that the space is full of grand entrances and big promises, followed by muted exits, and Epson are one of the few companies to maintain a steady presence. 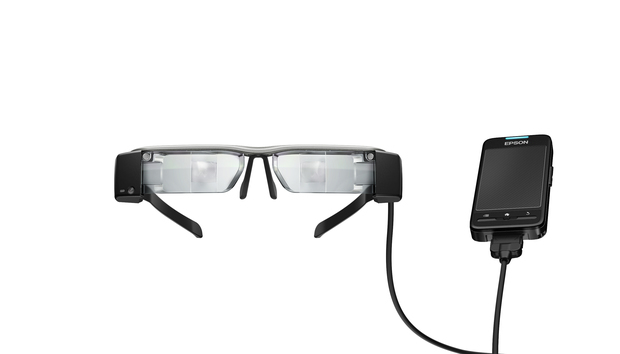 Eschewing the trendy but not yet ready consumer market, Epson’s Moverio smartglasses are firmly targeting the enterprise space. While the likes of Microsoft’s HoloLens, the Daqri Smart helmet and the infamous Glass are all in their early stages, Epson has been in the wearable tech space for some five years now and are now onto its third generation of smartglasses. In those five years, the Japanese giant has built up partnerships with some 2000 Independent Software Vendors including Eyespeak [who we spoke to in 2014], various universities and hospitals, EasyJet, and more. The ISVs present at the showcase—dental imaging firm iDent, retail streaming service GoInStore, and tourism experience creators Art Glass—all sing the praises of Epson hardware. The Moverio is described as a “quantum leap” compared to an “unnamed search engine”, primarily due to the low cost, good battery life, comfort, robustness and the fact the device is binocular. This showcase was my first try with the Epson hardware, and it’s impressive. Though the accompanying control pad and bulkiness are somewhat clunky compared to that unnamed search engine’s offering, they feel much better and more well-balanced on the face. The screen, centred in your vision rather than far off in one corner, is far bigger. It might lack the cool factor of its competitors, but at half the price and market-ready it offers the most practical example of the technology yet.